These numbers reflect estimated student expenses for the 2018-2019 school year. Amounts will change slightly from year to year, but as the cost of college increases, the scholarship packages will correspondingly increase. Your official financial aid award will be included in a letter directly from Davidson. Outside funding will reduce or replace a student's work-study amount. Outside funding of $1,500-$1,775 will first eliminate the work-study expectation and the amount in excess of $1,500-$1,775 will then reduce the amount of Davidson College grant on a dollar-for-dollar basis. Davidson requires all students to have personal health insurance. Students not covered by a family insurance plan can have the amount of Davidson grant increased to pay for student health insurance offered through Davidson. Students receiving this aid award must be enrolled on a full-time basis and must maintain satisfactory academic progress. The work-study award represents approximately 7-8 hours of work per week. The amount of work-study award ($1,500-$1,775) will remain the same for second, third, and fourth-year students. Students remaining in their jobs from year to year see an increase in their hourly pay rate. The room and board allowance is based on the cost of a double room and the 21-meal board plan. The travel allowance varies depending on the student's state of residence. Davidson College is committed to the premise that an excellent liberal arts education is one of the best investments a family can make. Today, our commitment to affordability has never been stronger. Through the Davidson Trust, we became the first national liberal arts college to replace loans with grants in financial aid packages. Davidson meets 100% of students' calculated financial need entirely with grants and student employment. Read more. Through the generosity of Davidson alumni and friends, the College offers merit-based scholarships to students whose accomplishments mark them as having extraordinary potential for impact on the Davidson community and for future contributions to society. Davidson merit scholarships are awarded through special nominations, special competitions, special applications, and through the strength of the admission application. 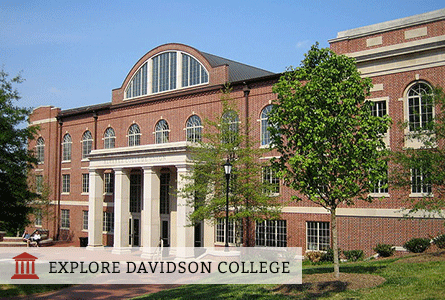 Davidson College follows a need-blind admission policy for U.S. Citizens and Permanent Residents. Approximately 50% of Davidson students receive need-based aid. More than 60% receive aid from some source. Use Davidson's Net Price Calculator to estimate the financial aid for which you are eligible.